My First Pattern and a Giveaway! I am so thrilled to finally get to reveal my first pattern to you! This pattern was so much fun to create, even though pattern writing is much more time consuming that I originally gave it credit for. Please forgive my picture-heavy post in advance. I just LOVE this quilt and it was such a glorious spring day. I couldn't seem to stop photographing it. Another little note on the photo session- I'm pretty sure you all know that I'm a teacher, but I don't know if I've mentioned that I teach in my neighborhood school. I know that some teachers wouldn't enjoy running into students everywhere they go, but I really love it. These photos were taken at our neighborhood park, and two of my former students happened to be there. They jumped at the chance to assist me by holding the edges of the quilt, and they did a splendid job. They held the quilt perfectly, but still managed to duck behind the quilt to stay out of the photos. Thanks a bunch ladies! Did you ever play with paper dolls as a child? I don't mean paper dolls that you cut out, but the ones that had clothes that you could change by bending the tabs and hanging them on the doll's shoulders? Well, the shape of the blocks in this quilt remind me of the tabs on paper doll clothes, and the retro fabulous prints go right along with that as well, so I decided to name this pattern Paper Doll Dress-Up! It's difficult to tell in the pictures, but I quilted this in soft pink thread. I pieced the back with bold stripes using many of the prints in the quilt, and the bright red polkadot binding creates the perfect frame! This quilt was so much fun to put together. 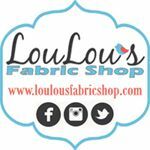 The majority of the fabrics are Scrumptious by Bonnie and Camille, and working with their fabrics always put a smile on my face! The finished quilt measures 64x64 inches (block size 16 inches finished). Paula at The Sassy Quilter tested the pattern for me and her quilt is gorgeous! You should definitely hop over and see the pattern in a different color palette! Now for the giveaway! 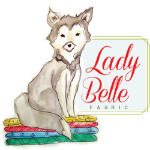 I want to give away digital patterns to three readers! To enter, just leave a comment letting me know what colors you would like to use to make the pattern. I'll use a random number generator to choose the winners next Wednesday and announce them in next week's Needle and Thread Thursday post. Just be sure to leave your email address if you're a no-reply blogger. Good luck! Paper Doll Dress-Up is for sale on Craftsy, as well as in my Etsy shop. I hope you'll check it out! Happy Thursday, y'all! Between Monday's holiday, as well as the fact that my days tend to run together during the summer, I have just realized that today is Thursday, and that I haven't posted NTT yet today...oops! So, Needle and Thread Thursday is taking a break this week and will return next week. Be sure to keep an eye out later this evening though, because I have an exciting reveal and giveaway coming. I can't wait! 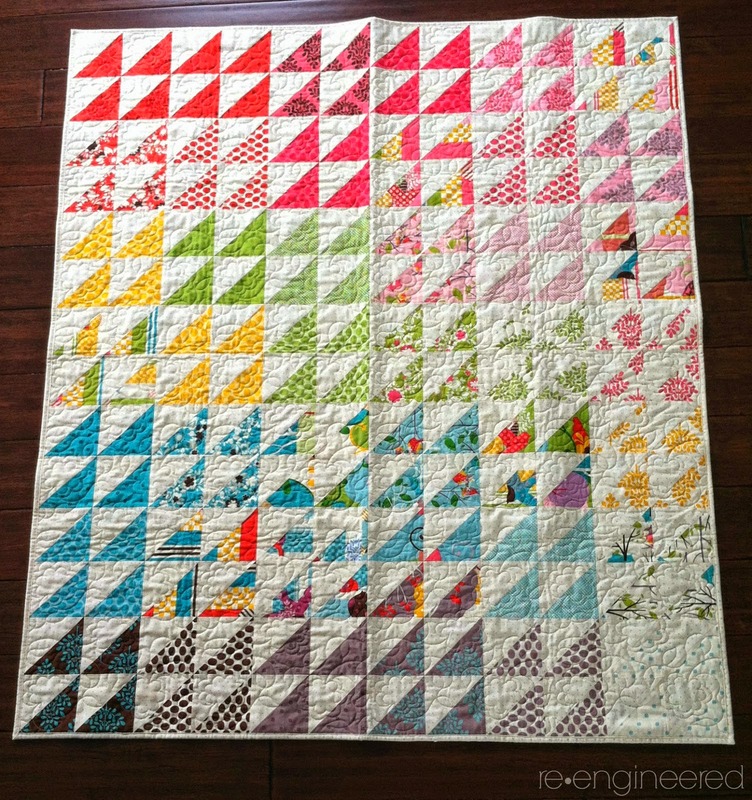 This quilt was absolutely, positively done in a hurry! I started cutting the fabric on Saturday morning, and I didn't even get a chance to write a post for it mid-process. Y'all know that once summer arrives, quilting happens at all hours of the day and night around here, but I had a very specific reason for speediness with this one. I found out that my dad is passing through town on business, and since this quilt needs to get to my mom, I decided that I would finish it quickly so that I could send it back with him. It just seemed easier than shipping it! This quilt is a departure from my norm in a lot of ways. This is my very first plus quilt, and I have to say that it was fun to put together. The one thing I wasn't used to was having to draw it out, and rely so heavily on my drawing when I laid out the design. Usually, once I have the design in my mind, I can conceptualize it and not need to cheat by using the drawing. The center of the quilt is fairly straightforward (the complete plusses), but keeping the partial plusses on the edges laid out properly was a little tricky. I don't really know why. It was't terribly onerous though, and I will make this pattern again for sure! The person who will be receiving this quilt likes very modern design. I definitely think this pattern, along with the mod feel of the prints fit the bill. These fabrics aren't ones I had seen before buying them for this quilt. The majority of the fabrics are called Penelope by Camelot fabrics, and I think the more muted colors are so pretty. Other than Sand and Sea Glass, this quilt may be the most low volume quilt I've ever made. The name I chose for this one is a also little different from my usual choices. Since the pattern is so distinct, I wanted to include it in the name in some way without actually using the word "plus." I like that the name Absolutely, Positively can be used to describe lots of different moods, and I think it sounds catchy! Well, I'd say that summer has absolutely, positively started off on the right foot! Pardon the pun, I just couldn't help myself! I thought it would never get here, but summer has finally arrived! Remember last July when I was lamenting the fact that teachers had to go back to school for inservice in the last week of July and that kids started right at the beginning of August? Well, here's the payoff. Our last day of school was yesterday, while I know that some places are in school for a few more weeks. There is nothing like the feeling of walking out of the school for the last time of the school year! It was fun to wind down last night by finishing up my Christmas quilt. You know, I thought that it felt a little weird to use Christmas fabrics in May, but I have to say that it felt even more strange trying to take photos of a Christmas quilt when it's blazing hot outside. The quilt just felt out of place. So do me a favor and imagine that the quilt has a snowy backdrop instead of blooming roses. My new favorite pieced backing method is to buy half yard cuts of fabrics, and save a quarter yard of each print for the backing. I've been loving the bold stripes, and I really love that there is virtually no waste. I also love that I don't have to search out a single fabric that compliments the front. This quilt is 60x64" finished, and for a quilt of this size, I usually use about 14 different fabrics. That works out perfectly for piecing the backing this way as well. I've named this one Comfort and Joy. Of course, it's a nod to the carol God Rest Ye Merry Gentlemen, which is one of my favorites, but also representative of what a quilt can bring to its recipient. And frankly, I'm feeling plenty of Comfort and Joy myself now that school is out! I love it when things work out like that! Once again friends, I must apologize for not getting the time to comment on the links from last week's party. This is our last week of school, and it has been crammed with field day, programs, and end of the year paperwork, not to mention the end of season baseball tournament, both during the school day and in the evenings. I can't wait for the relaxing days of summertime, where I can read and comment on blogs with leisure, and get plenty of sewing time as well. After finishing up Mardi Gras Parade on Saturday, I started working on a commissioned Christmas quilt. The top was so quick to put together on Sunday afternoon, but I haven't been able to touch it since. Although it does feel a little odd to be working on a Christmas quilt in May, I am actually happy about the timing. Sometimes when it gets closer to Christmas I get tired of looking at tons of red and green. Last week's party was awesome! 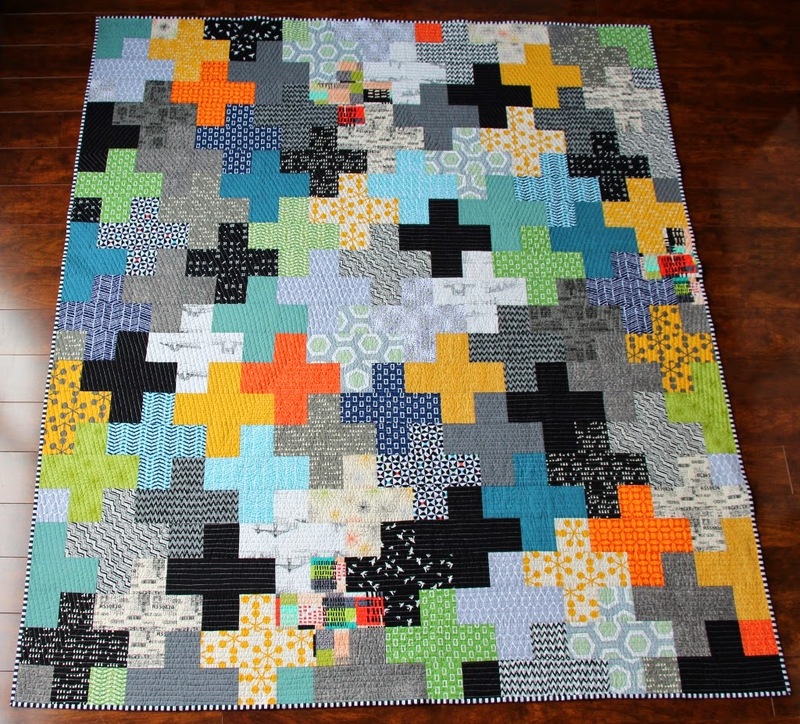 Janet at Simply Pieced linked up her finished X+ quilt top, and it is gorgeous. Janet brought this to our last MQG meeting, and I can certainly vouch for the fact that it is even more beautiful in person! Stitch Mischief showed off this fantastic plus quilt. The back is pretty cool as well, so check it out if you missed it! and Seriously...I think it needs stitches linked up this fabulously fun mustache quilt! Ready to party this week? I can't wait to see what you're working on! I finished up the Mardi Gras quilt last night, and I must say that I really love how it turned out! Unfortunately, it has rained here for two days, making everything soggy, and therefore making a creative photo shoot completely out of the question. The sun finally came out this afternoon and managed to dry out my deck enough to get a few pics though. This one is 80x100" so it's a doozie! I always feel really proud when I finish a quilt this size, but I have to say that I don't enjoy quilting a quilt of such monstrous size. It's just SO heavy! And don't even get me started on basting. I went with bold stripes across the backing using six of the prints in the front of the quilt. I didn't have any scraps, and I didn't want to do a single fabric on the back, so I thought this was a good alternative. Oh, and speaking of pride- not a single pucker on the back! I don't usually get puckers in my quilting, but when I make a quilt this big, I always heave a big sigh of relief when it doesn't happen. I think the scrappy binding on this one is just perfect, with the added bonus that it used up the last bits of the fabric, so nothing got added to my baskets- hooray! This one is destined for someone who absolutely adores Mardi Gras (as many of us do who call Louisiana our home state). I really hope she loves it! It's that time again! Time to admire some of the best quilty eye candy around the web. 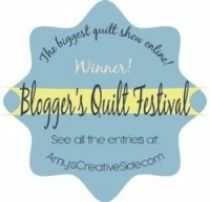 It's time for the Blogger's Quilt Festival hosted by Amy's Creative Side! I've decided to enter Bohemian Charm in the Original Design category. In my head, I refer to this pattern as Strip Tango since the pieces are basic 4.5" strips from fat quarters, though I haven't actually created a pattern for it (I just might have to do that!) This quilt sort of came together like a big puzzle. I knew that I wanted the cutting to be simple, and that I wanted the strips to be arranged randomly throughout the quilt. Beyond that, I just started laying it out and sewing it together! The fabrics are a mix of Amy Butler's Cameo, Lark, Love, and Alchemy lines. Since the front of the quilt was so vibrant, I opted to use this pretty gray fabric along with the scraps for the backing. To give you an idea of the scale, the entire label only measures 2.5 x 3 inches. I've really worked to keep my handwriting small so that my labels don't take up too much space on the back of the quilt. I made this quilt in January, when the grip of winter was making everything so bitterly dreary. The simple, but fun piecing of these Amy Butler fabrics brightened my day then, and it still does! Quilting- Free motion meandering by me! Be sure to head over to Amy's Creative Side to check out all of the fantastic inspiration! You know you want to! 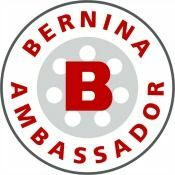 Welcome to TGIFF friends! I'm so excited to be hosting this week. Whew! This week has been a whirlwind and I am SO glad to have made it to Friday! I've been working on this queen sized quilt for the past week, and I managed to finish up the top. This quilt will be a gift for someone in my family who just loves Mardi Gras. Louisiana is one of the only places I can think of where vibrant greens, purples, and golden yellows are considered to be perfectly matched. I'm not saying that we all decorate our houses with these super bright colors or anything, but we do love them when Mardi Gras rolls around. 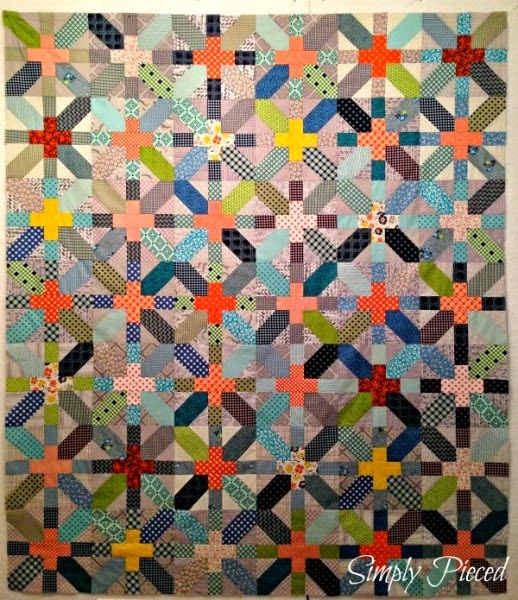 I decided to use slightly muted tones of these colors in the quilt, but it's still vibrant enough to be fun and fresh. Because the quilt is so big I kept the pattern simple. Now it's your turn to show off your finish for this week! Just be sure your post includes a TGIFF button or text link back to the party so others can find it too! Oh, and be sure to spread around plenty of comment love! 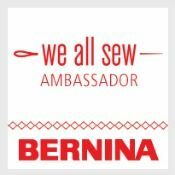 And if you missed Needle and Thread Thursday yesterday, hop over and link up there too. It's still open through today! Hey y'all! It's party central this week at My Quilt Infatuation. Of course today is NTT, and tomorrow, for the very first time, I'll be hosting TGIFF! I do have a quilt top finished to share with you, but since tomorrow's part is all about finished projects, I'll save it for then. I hope you'll hop over and party twice! Oh, and by the way- I'll still leave NTT open through Friday as always. On a personal note- I want to thank each and every one of you who sent me a note of encouragement when I was studying for my last exam. I received my scores over the weekend and I am so proud to say that I aced it. Now I can add the Reading Specialist and Gifted Education endorsements to my teaching license! Your thoughts and well wishes really lifted me up during my weeks of studying, and I want you to know that I truly appreciated them. Christa Quilts Modern Logs is absolutely fabulous. I love the colors, and movement of the blocks! 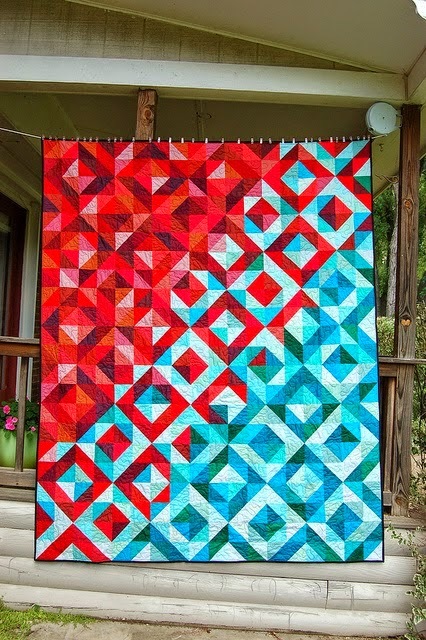 Quilting Mod's HST quilt is absolutely stunning! 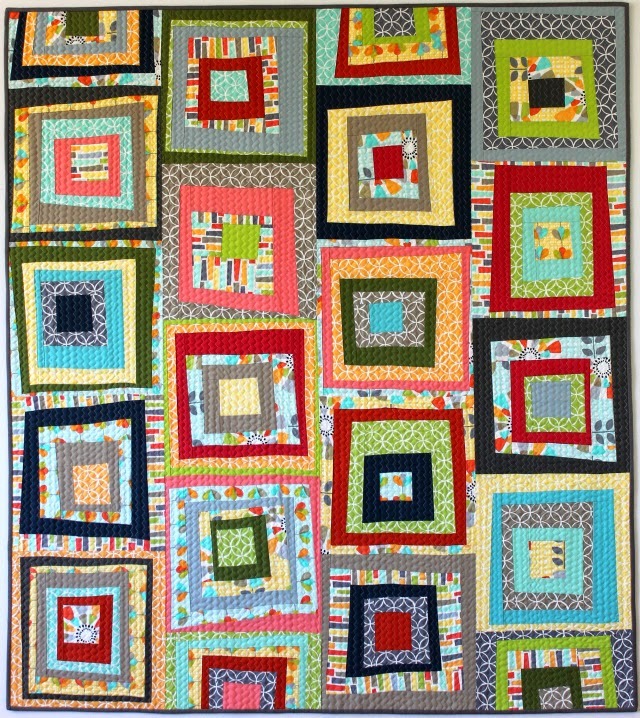 and re-engineered shared this sweet and happy baby quilt! I know I've said this before, but I'll say it again and hope my sincerity comes through- there are always SO many amazing links every week that choosing highlights is really tough! Keep it up, y'all. You are such an inspiration! Time to link up. Bring it on- and don't forget to hop back over tomorrow and link up to TGIFF too! This girl! 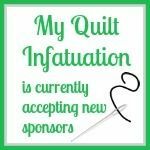 This is an exciting week here at My Quilt Infatuation. You can party twice! Right after my regular Needle and Thread Thursday party this week, Friday I'll be hosting TGIFF. I have a new quilt in the works, and it's a big one (80x100"). I'll be working hard all week so that I can share the finished top then! Twice the partying means twice the inspiration and twice the FUN, so be sure to hop on over and link up your latest project (finished or WIP) to NTT on Thursday, and then swing back by on Friday to link your finishes to TGIFF! Well friends, I'm getting really close to being able to share my pattern with you. I think it's all finished, but you know how sometimes things make sense in your head, but when you write it down, details can get confusing? I really want to make sure that didn't happen with the pattern, so it is currently being read and tested by a couple of quilty friends, and once I get the green light from them that everything is clear, I'll be able to release the pattern and show you the quilt. I do, however, get to show you this little baby quilt that I made from the scraps. Aren't the colors so happy and sweet? Bonnie and Camille fabrics (most of these are from the Scrumptious line) always have a way of always making me smile. ps- you know what else makes me smile?... when my roses are full with tons of lush blooms! I used every bit of leftover fabric in the quilt, so that left nothing for the back. So this is not my usual pieced backing. I love this huge aqua polkadot, and added a little bit of interest with a stripe of red polkadot. I'm not sure that I would have used such a big polkadot on a bigger quilt, or if I had lots of scraps in the backing because I think it might be too busy. But for this little one, I think it's just perfect! I decided to call this one Shortcake because of the sweet colors, the stacked layers, and the fact that it was so quick and easy to put together. The finished quilt measures 42x42." 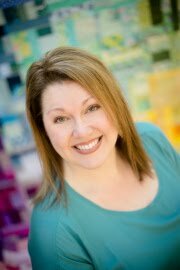 Beth at Plum and June is hosting her New Quilt Blogger Blog Hop again this year! I participated in last year's hop and I can say- without a doubt, that it really helped me get my bearings in the blogging community. Beth is super organized, and also includes an advice and tech help series from more established bloggers. These posts were really helpful in helping me find my voice, as well as making my blog design reflect the image I wanted. 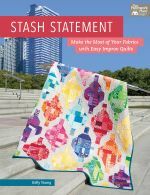 Of course, the best part of participating in a blog hop is meeting new friends and gaining inspiration from others who share a love of modern quilting and blogging. 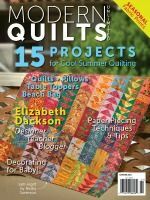 So, if you're new (within the last two years) to blogging, and are a modern quilter, you should definitely head over to Plum and June and check out the details for this year's hop! You won't regret it!